I love summer food. I love winter food too, but the freshness of summer food is my favorite. And what better way to experience it than with local grown produce! Sweet corn, heirloom tomatoes, peaches, and garden greens and herbs. I wish I was making a summer Tuscan salad right now! Succotash, panzanella, cool refreshing salsas and of course, garden salads rank up there with some of my favorite things. Fresh grilled seafood, cold white wine or ice cold beer… does it get better!? One of my absolute favorite summer dishes to make and to eat is salad caprese. An old classic, tried and true, simple, and a hit every time. Those 3 fundamental ingredients… how perfect. Simply perfect. My take on the classic incorporates a couple things you might not consider without having tried it first. But trust me, I will not steer you wrong, especially with one of my all time favorite dishes. Over an open flame or top grill, roast the pepper until black on all sides. Place in a bowl, cover with plastic wrap and let cool. When cool peel the pepper under running water, removing all the seed and stem. Cut into strips and reserve. While the pepper is cooking, put the vinegar in a small heavy bottom sauce pot with the sugar and bring to a boil.. Split the vanilla bean and scrape the seeds into the vinegar along with the vanilla pod. When slightly thick (lightly coats back of spoon) remove from heat, and place in fridge until cool. Cut the tomatoes into random wedges and slices. Place in mixing bowl. Tear the basil into small strips and add to the bowl. 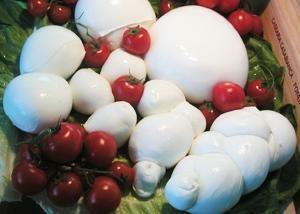 Slice the mozzarella thickly and add to the bowl. Add the peppers to the bowl. Lightly and gently toss with olive oil, black pepper and a small sprinkle of salt. Heap in the center of a place, leaving the rims of the place clean. With a spoon, drizzle the vanilla/balsamic reduction over the salad lightly. Garnish with a little more cracked pepper, tiny sprinkle of salt and drizzle of olive oil. Serve immediately. This salad stands alone. If anything is to be served with it, it would be something along the antipasta line: paper thin sliced cured meat, marinated mushrooms, grilled eggplant with olive oil and chick peas, olives, artichokes, etc. Remember, this is a simple dish. Too much complexity will ruin its beauty. This is a summer dish, a masterpiece.